The new weeGo buggy trailer is everything that you would want with a buggy style trailer. The buggy trailer package comes with a tow bar to connect to the adult bicycle and stroller wheels. The weeGo accommodates one or two children. You provide the pedal power and Weehoo provides the rest. Another great product for you to use to get out and explore the world. Have a ball with the weeGo buggy trailer. The lightweight, versatile trailer gives you everything you need for one price. Immediately hit the road and have what you need to seamlessly transition into stroller mode. 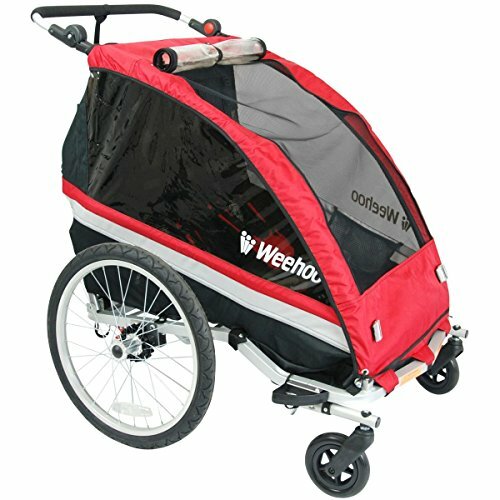 Cycling, strolling, or running, Weehoo has you covered. The weeGo seat allows for a one or two child set up. Both seats have five point harnesses. The push button alloy wheels detached for easy storage. There are brakes on each wheel. Reflectors placed on front, rear, and sides. Safety flag and pole is included. Huge storage compartment in the rear of the buggy. The stroller wheels and tow arm also detach to make transport and storage a breeze. The adjustable foam stroller handle can be positioned at a number of angles to suit the ergonomic needs of the user. The sleek design makes for streamlined towing and will make you the envy of the neighborhood. Another great product brought to you by Weehoo, the family fun company. Get out there and get Weehoo'ing! If you have any questions about this product by Weehoo, contact us by completing and submitting the form below. If you are looking for a specif part number, please include it with your message.